With elliptical trainers, your feet follow a path that’s sort of a stretched-out oval known as an ellipse (hence, the name elliptical trainer). The motion feels like a mix between fast walking, stair-climbing, and cross-country skiing. Runners who need a day off from the pounding gravitate toward this machine like moviegoers to the concession stand. It’s also popular with walkers looking for a more spirited workout and people who are bored with stair-climbing or find stair-climbing hard on their knees. Precor, Reebok CCS, Life Fitness, StairMaster, and Startrac make the most popular models. The popularity of this machine has exploded in recent years. Newer models allow you to work your arms in an opposite motion to your feet, which allows you to burn additional calories. 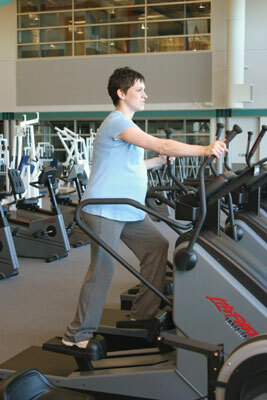 Elliptical trainers are gentle enough for prenatal workouts. Limit backward pedaling. Contrary to popular belief, pedaling backward does not work your buttocks more than pedaling forward (and it may even be hard on your knees). Both motions emphasize the front thigh muscles, so do it once in a while, but not for any prolonged amount of time. Use the machine’s versatile features. To adjust the intensity of your workout, you can pedal faster, raise the incline, increase the resistance, or any combination. Don’t lock your knees. Keep a slight bend in your knees, keeping the motion smooth. Remind yourself to stand up straight. Although the elliptical trainer lends itself to better technique than the stair-climber, you can still commit postural violations such as leaning too far forward and hugging the console.